We care about your pet! Dr. David K. Lukof and his wife, Hildi, opened the doors of Harleysville Veterinary Hospital on October 19, 1983, with the goal of providing excellent and compassionate veterinary care for this growing community. They started on the first floor of the stone building at 391 Main Street. In March 1991, the hospital moved into a new larger facility that was built directly behind the stone building. The modern facility was designed with the idea of providing comprehensive medical and surgical care for all their animal patients. In 2003 the two buildings were then adjoined for expansion of exam rooms and offices. The most recent renovation and addition was completed in 2012. Our hospital contains a laboratory, pharmacy, x-ray, dental and surgical area. Most diagnostic and treatment procedures can be handled within our facility. 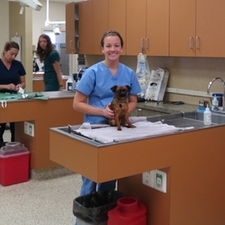 A large kennel area allows for quality patient care in a comfortable environment. An intensive care area and isolation room are also in the new facilty. Over the years many doctors and support staff have joined our veterinary team to meet the demands of this growing community. With fourteen veterinarians, Harleysville Veterinary Hospital is one of the largest veterinary hospitals in Montgomery County. We seek to blend the experience of our senior doctors and the most recent training and fresh outlooks of our newer doctors to provide our clients with the best possible veterinary care. Our client service representatives and technicians are vital parts of the veterinary team and work hard to assist us in fulfilling our mission. We appreciate the support and trust of our clients, some who travel many miles to see us. It is this loyalty and trust that keeps us striving to improve our services and provide our clients with the best possible veterinary care. We understand that sometimes that means high tech diagnostic services and procedures, and at other times, just an understanding and sympathetic ear to help solve a problem. In 1992, Harleysville Veterinary Hospital first earned accreditation by the American Animal Hospital Association (AAHA). To achieve this distinction, the hospital voluntarily participated in a comprehensive, quality assessment of its facility, equipment, practice methods and pet health care management. Our AAHA accreditation shows our commitment to excellence, as well as the high standards that we uphold. Less than 14 percent of the small animal facilities in the United States are accredited members of this association. In order to maintain hospital member accreditation, the hospital is evaluated regularly by the association's trained consultants. Harleysville Veterinary Hospital is proud to maintain this accreditation from the American Animal Hospital Association.